A Murder in Passing by Mark de Castrique, a Mysterious Review. Review: While Sam Blackman and his business partner Nakayla Robertson are hunting mushrooms in the Kingdom of the Happy Land, an autonomous community founded by freed slaves in the aftermath of the Civil War, where they lived and worked the land as a commune, he stumbles down a ravine onto a decayed log containing the skeleton of a man in A Murder in Passing, the fourth mystery in this series by Mark de Castrique. Together with the bones Sam finds a bullet, suggesting the man didn't die of natural causes. And while Sam and Nakayla entered the area from within North Carolina, the body was actually in South Carolina, which takes over the investigation. Sam and Nakayla are willing to let the authorities handle it … except the next day they receive a visit from Marsha Montgomery requesting their services: to find a rare photograph stolen from her home, depicting several generations of women in her family taken in 1932. But Sam and Nakayla are suspicious: the photograph was stolen 45 years ago … and was taken in the Kingdom of the Happy Land. Two events involving the Kingdom of the Happy Land don't appear within a two-day period without some connection. Something brought Marsha Montgomery to our door and that something had once been a living, breathing human being who wound up entombed in a hollow log. If we got involved in the case, it would have to be with eyes open that our client sought us out for reasons yet to be revealed. Those reasons could be to keep something hidden rather than bring it to light. A very interesting and in many ways clever story is crafted from this missing photograph. It is something the author has done with all the books in this series (to date), to take a real place or historic event (or both) and weave a credible whodunit-style mystery around it. Sam and Nakayla are a very appealing PI team, each bringing a separate set of skills to bear, and though they also have a personal relationship, that subplot rarely intrudes for very long. The plot moves along at a steady pace, and includes an often fascinating mix of history and mystery. The identity of whodunit is not unexpected given how the story plays out — in some ways this book is actually more of a howdunit — but the twist, if that is indeed what it is intended to be, comes across as an unnecessary complication (though it does, admittedly, nicely tie up a loose end). 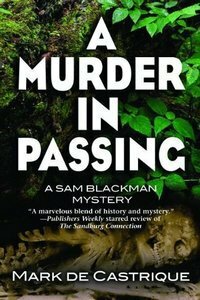 On balance, though, A Murder in Passing is another strong entry in this fine series. Acknowledgment: Poisoned Pen Press provided an eARC of A Murder in Passing for this review.